Purplish lesions of Kaposi's sarcoma. Credit: NIH. 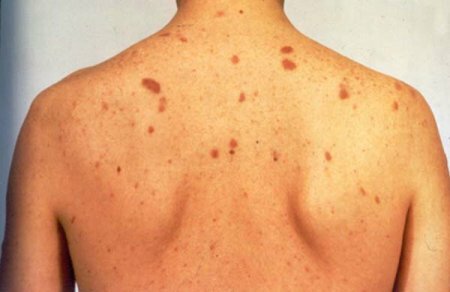 Kaposi's sarcoma is a condition, characterized by malignant skin tumors, which is a prominent feature of AIDS. In the past, Kaposi's sarcoma developed slowly and was extremely rare. In patients with AIDS, it is highly aggressive and tumors soon become widespread. The tumors, consisting of purple to dark brown nodules, usually start on the feet and ankles, spread farther up the legs, and then appear on the hands and arms. In people with AIDS, tumors also commonly affect the gastrointestinal and respiratory tracts, where they may cause severe internal bleeding. For mild cases of Kaposi's sarcoma, low-dose radiotherapy is usually effective. For more severe cases, anticancer drugs may be necessary to slow the spread of the tumors. Named for the Austrian dermatologist M. Kaposi (1837–1902).